Report from the Nidderdale League. 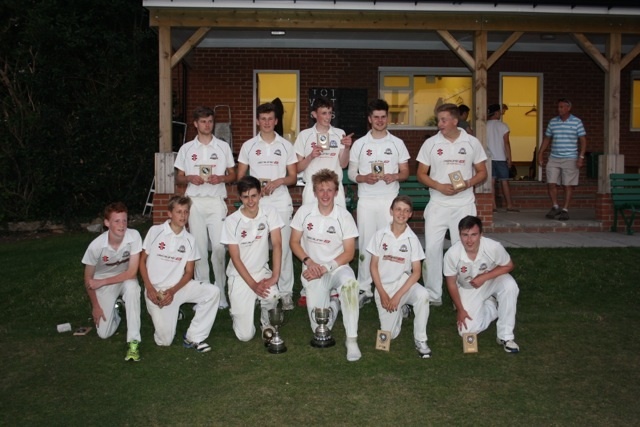 The U17’s Arthur Barrett Cup final was held on Thursday 17th of July at Bilton Cricket Cub, the finalists were Knaresborough CC, the current Cup holders and Ouseburn CC. On a perfect English summer evening, Knaresborough won the toss and elected to bat. The Knaresborough openers, Jack Whitham (46) and Callum Beasley (18) quickly took their opening stand to 51 runs before the first wicket fell. Josh Tear batting at 6 made a very useful 23 not out in only 14 balls thus setting the scene for a very competitive total of 136 for 7 for Knaresborough in their allotted 22 overs. Best of the Ouseburn bowlers was Jacob Lacey with figures of 5 overs, 2 Wickets for 23 runs at an average of 11.5. The Ouseburn innings stuttered early on, with the loss of 2 wickets for 9 runs before Daniel Lever steadied the ship cracking an excellent 37 runs for the match before being bowled by Ed Barnes. Other contributors with the bat were Jack Sheridan with a spirited 30 and Luis Rust with 23 not out. Despite a brave rearguard action Ouseburn were still 12 runs short at the end of their allotted 22 Overs. Best of the Knaresborough bowling was Ed Barnes with a very tight spell which returned 3 Wickets from 5 overs for only 10 runs. Winners were Knaresborough with 136 for 7 against Ouseburn’s 124 for 9. The Ed Cousens Man of the Match was Jack Whitham from Knaresborough for his innings of 46 which set the conditions for a Knaresborough win. The League would like to thank, their Sponsors, Arrowselfdrive and also Bilton CC for hosting the match which was a magnificent advertisement for Junior Cricket in the Nidderdale area. Thanks also go to Alan Kitchen and Barry Canham for umpiring the game.